In the morning we could appreciate area properly. The beach stretched for miles and miles, with clean sand and clear blue water. The camp was fairly remote, the surrounding area being sparcely populated with little shacks built from woven palm fronds and set amongst the coconut palms and mango trees which were the dominant flora. Everywhere were coconuts and mangos. My sister and I invested a fair amount of time learning the difficult art of de-husking a dried coconut. Contrary to what many may believe, they don’t come in a nice hard shell ready to be cracked, but a very tough and thick husk which is devillishly difficult to remove. The mangoes were much easier, they came in a plastic bag, carried by an african dude. Also on offer was any seafood delight you could care to imagine. The fishing boats would come in every morning and guys would wonder around peddling their catch of the day. Over the few days we were there we had barracuda curry, rock cod with crayfish, and plenty of prawns and calamari. It was seafood bliss. This was complimented by the other local produce, cashew nuts, which are sold in big bags all along the road, and Portugeuese bread rolls, called pao, which are made in tiny little ovens in tiny little huts all around the area and can be bought freshly baked for a few cents a roll. Having seen the huge fish the local spear-fishermen were bringing in, my dad and I were keen to give it a go. We drove to a lovely beach a bit further south and put on our wetsuits and swam out. It was about a km swim before we hit the reef. It was bit scary floating out there and seeing how tiny the car looked on the beach, so I mainly kept my head down. The reef was really beautiful with lots of coral, gulleys and big arches of rock through which the numerous reef fish swam. But we weren’t allowed to shoot reef fish unfortunately and we didn’t see too many game fish. We did see one, which my dad had a shot at, but with his little freshwater speargun, the spear didn’t go through. On one of our outings I swam through a big school of we later decided were barracuda, but by the time I had worked out what I was looking at the school had disappeared. In the end we failed to provide for the family, but we did have a good few hours of good snorkelling, seeing lots of colourful coral, reef fish, sharks and dad even saw a big turtle. New Years was a fairly quiet one, with the inhabitants of the camp, mostly South Africans, gathering on the beach for a big bonfire. Later the camp did a fireworks display which was quite impressive given the remoteness of the place. Sophie and I slept on the beach, to be woken by the first light of 2010, and we started the year with beautiful early morning swim. It was all too soon before Morrungulo was at an end and we sadly had to pack up the camp. My family had to leave to get back to work, but we decided to drive up the coast a bit and spend another night. So a couple hours after they had left, we ambled off and headed up the coast to Vilanculos. In the morning we could appreciate the area properly. The beach stretched for miles and miles, with clean sand and clear blue water. The camp was fairly remote, the surrounding area being sparcely populated with little shacks built from woven palm fronds and set amongst the coconut palms and mango trees which were the dominant flora. Everywhere were coconuts and mangos. My sister and I invested a fair amount of time learning the difficult art of de-husking a dried coconut. Contrary to what many may believe, they don’t come in a nice hard shell ready to be cracked, but a very tough and thick husk which is devillishly difficult to remove. The mangoes were much easier, they came in a plastic bag, carried by an african dude. Also on offer was any seafood delight you could care to imagine. The fishing boats would come in every morning and guys would wonder around peddling their catch of the day. Over the few days we were there we had barracuda curry, rock cod with crayfish, and plenty of prawns and calamari. It was seafood bliss. This was complimented by the other local produce, cashew nuts, which are sold in big bags all along the road, and Portuguese bread rolls, called pao, which are made in tiny little ovens in tiny little huts all around the area and can be bought freshly baked for a few cents a roll. Having seen the huge fish the local spear-fishermen were bringing in, my dad and I were keen to give it a go. We drove to a lovely beach a bit further south and put on our wetsuits and swam out. It was about a km swim before we hit the reef. It was bit scary floating out there and seeing how tiny the car looked on the beach, so I mainly kept my head down. The reef was really beautiful with lots of coral, gulleys and big arches of rock through which the numerous reef fish swam. But we weren’t allowed to shoot reef fish unfortunately and we didn’t see too many game fish. We did see one, which my dad had a shot at, but with his little freshwater speargun, the spear didn’t go through. On one of our outings I swam through a big school of we later decided were barracuda, but by the time I had worked out what I was looking at the school had disappeared. In the end we failed to provide for the family, but we did have a good few hours of good snorkelling, seeing lots of colourful coral, reef fish, sharks and even saw a big turtle. It was all too soon before Morrungulo was at an end and we had to pack up the camp. My family had to leave to get back to work, but we decided to drive up the coast a bit and spend another night. So a couple hours after they had left, we ambled off and headed up the coast to Vilanculos. In the next few days we hurriedly prepared for the next leg of the trip which for us would be about three weeks. 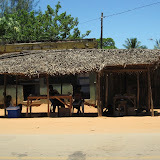 First stop would be a camping trip with my parents and sister at Morrungulo, Mozambique. Its a long drive, almost a thousand kilometers from Harare so we set off early with Me, Soph, Annie, my sister Louise in the lead and my parents following on later. There were no problems on the Zim side, customs, immigration so far so good. Then having got our scrap of paper with all the stamps and signatures on it we approach the border gate. “Have you gone through police clearance?”, “No, where do I do that?”. She points across the road where a couple of guys are sitting under a tree. “Yes, those guys”. I walk over and hand over our documents. He tells us that unfortunately the letter typed up and signed by my dad, authorising me to use his vehicle, requires a police stamp. I tell him nobody told me about any stamp. Ah sorry, you need a stamp. Uncomfortable silence. I offer to wait three hours for my dad who is on his way. Uncomfortable silence. He realises that we are not going to pay a bribe and gives up, “Agggh, you may proceed”. Somehow the Mozambique side was much more busy, a hectic whorlwind of running back and forth, filling in forms, showing documents and handing out cash. I do not fail to note the sign informing that over the counter visas for any nationality were just US$25 and not the exorbitant US$110 that I had paid at the embassy. They also seemed to take as long as handing over the money and getting a stamp, not the 4 hours wait that the embassy had warned us of. 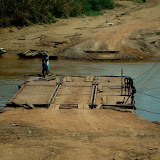 Eventually we cleared the border and were in Mozambique. The difference between the two countries is immediately obvious. Although the people look much the same, most don’t speak a word of English, speaking only their local language or Portuguese. It is also very obviously less developed than Zimbabwe, even with Zim in its current state. Just about the only modern buildings, and by that I mean buildings more complex than single room huts, are those built by the Portuguese before they were expelled from the country, and are almost always completely derelict. The difference in architecture, old decaying feel of the buildings and the foreign language all combined to make my photographic eye very itchy, however we didn’t have time to stop and take photos as we had another ten hours or so ahead of us. We had a quick stop at the supermarket to get some goodies, and also changed some money with one of the notoriously shifty money-changers. Despite our vilgilance he managed to bamboozle us and would have gotten away with our bucks had it not been for Sophie’s recount, some shouting and some very quick reversing. Soon we are on the road again, going along at the omg-even-worse-than-Australia speed limit of 100km/h. Unfortunately unlike Zimbabwe with its $20 speeding fine, it seems the Mozambique government’s biggest income is from speeding fines and they are not to be trifed with. Each little town with its picturesque, dilapidated shacks and casas requires a slow down to 60, made even worse by the fact that we didn’t have time to slow down to a complete stop and take photos. There was a lot of drive-by photography on this trip. Soon the GPS was telling us there was 60km to go. Almost there! It was at this point that the road, which had so far been decent, began to deteriorate. It was not long before the potholes were such that it became easier to drive along the dirt on the sides of the road than the tar itself. This lead to interesting situations where the locals would be walking along the tar, while the traffic drove by them on either side. Eventually at about 9pm we arrived at the campsite, a nice grassy area, shaded by coconut palms and scattered with coconuts. In the middle rose a two story, palm thatched hut or baracca, complete with a powerpoint which provided a few hours of power per day. My parents arrived safely a couple of hours later. In the next few days we hurriedly prepared for the next leg of the trip which would be about three weeks. 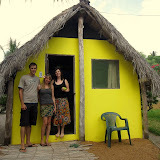 First stop would be a camping trip with my parents and sister at Morrungulo, Mozambique. Its a long drive, almost a thousand kilometers from Harare so we set off early with Me, Sophie, Annie, my sister Louise in the lead and my parents following on later. There were no problems on the Zim side with immigration or customs. Then having got our scrap of paper with all the stamps and signatures on it we approached the border gate. “Have you gone through police clearance?”, “No, where do I do that?”. She points across the road where a couple of guys are sitting under a tree. “Yes, those guys”. Somehow the Mozambique side was much more busy, a hectic whorlwind of running back and forth, filling in forms, showing documents and handing out cash. I did not fail to note, with extreme irritation, the sign informing that over the counter visas for any nationality were just US$25 and not the exorbitant US$110 that I had paid at the embassy. They also seemed to take as long as handing over the money and getting a stamp, not the 4 hours wait that the embassy had warned us of. Eventually we cleared the border and were in Mozambique. The difference between the two countries is immediately obvious. Although the people look much the same, most don’t speak a word of English, speaking only their local language or Portuguese. It is also very obviously less developed than Zimbabwe, even with Zim in its current state. Just about the only modern buildings, and by that I mean buildings more complex than single room huts, are those built by the Portuguese before they were expelled from the country, and are almost always completely derelict. The difference in architecture, old decaying feel of the buildings and the foreign language all combined to make my photographic eye very itchy, however we didn’t have time to stop and take photos as we had another ten hours drive ahead of us. We had a quick stop at the supermarket to get some goodies, and also changed some money with one of the notoriously shifty money-changers. Despite our vilgilance he managed to bamboozle us and would have gotten away with our bucks had it not been for Sophie’s recount, some shouting and some very quick reversing. Soon after we were on the road again, going along at the omg-even-worse-than-Australia speed limit of 100km/h. Unfortunately unlike Zimbabwe with its $20 speeding fine, it seems the Mozambique government’s biggest income is from speeding fines and they are not to be trifed with. In addition, each little town with its picturesque, dilapidated shacks and casas requires a slow down to 60, made even worse by the fact that we didn’t have time to slow down to a complete stop and take photos. There was a lot of drive-by photography on this trip. Adventures of Dean and Sophie is powered by	WordPress 2.8.5 and delivered to you in 0.263 seconds using 30 queries.